Despite the housing bust and the recession, these 10 U.S. cities still managed to record population gains of 30% or more in the decade ending in 2010, according to the Census Bureau. The national average was less than 10% during that time. Charlotte initially made its mark as a transportation hub, but these days the banking industry reigns. Charlotte is the "second largest financial center in the nation, after New York," said Bob Morgan, president of the Charlotte Chamber of Commerce. 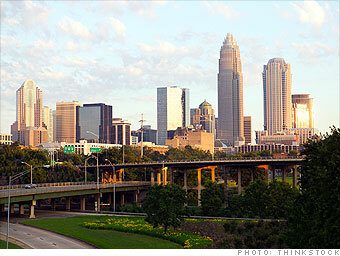 Bank of America calls Charlotte home, while Citi, Ally Financial, JPMorgan and Wells Fargo all host operations there. The jobs offered by these big banks have helped this city's population to swell over the years. Also contributing to the area's growth is the "half-back" phenomenon. North Carolina receives a large number of former Northerners who first retire to Florida, but later decide to leave the state. "They get hit by their second or third hurricane and they move halfway back to their old homes," said Morgan.